Since Safety protocols are application protocols, a safety network‘s performance depends on the underlying data transfer protocol. The base protocol selection determines the available bandwidth and the cycle times, but also functional features such as hot plugging capability or data communication via cross-traffic. Cross-traffic plays a crucial role in the performance of safety-oriented systems. In networks supporting cross-traffic, safety nodes can transmit signals directly to each other without routing them through a master. This provides for optimized reaction times in hazardous situations. 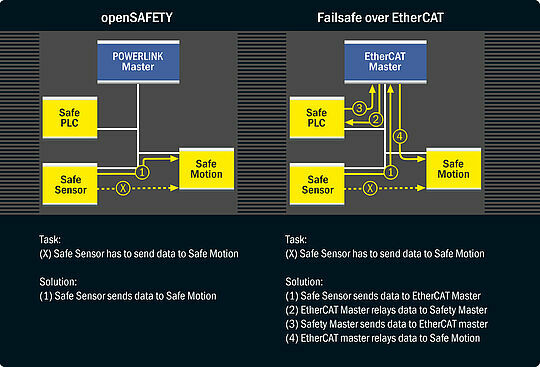 On a network not supporting cross-traffic, safety nodes send their signals to a fieldbus master node, which relays it to the network‘s safety master for acknowledgement. It is then handed back to the fieldbus master node which forwards it to the receiving safety node. Compared to direct data transfer via cross-traffic, this process causes four times the signal delay – valuable reaction time elapses. Since the emergency stopping distance of an axis increases with the square of the fault response time and negative acceleration, quadrupling the signal transfer time will result in a 16-fold extension of the emergency stopping distance. 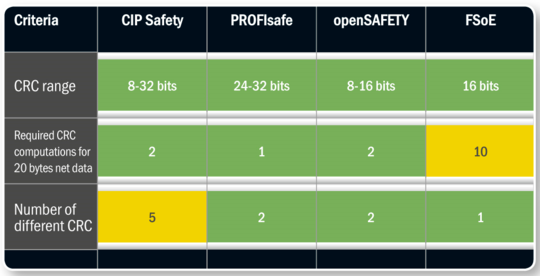 The required number of different checksums increases implementation complexity, resulting in higher development costs. Additionally, computation of multiple CRCs may result in significantly slower reaction to safety violations. Example for shorter signal transfer times due to cross-traffic: Cross-traffic enables safety nodes to directly communicate with each other (left), whereas signal paths are quadrupled in a system that does not support cross-traffic (right).